China Early Dynasties - HISTORY'S HISTORIESYou are history. We are the future. Ancient China - Early Dynasties: The ancient Chinese invented paper, gunpowder, matches, the compass, the umbrella, a movable type printing press, and more! They also created incredible philosophies, gorgeous art, and great legends. While other ancient civilizations accomplished great things, the accomplishments of the Chinese are remarkable because they were achieved during periods of time when China was cut off from the rest of the world. What is the name of the earliest known Chinese culture? The Earliest Settlements: The earliest known Chinese culture was the relatively sophisticated Yang-shao, whose people lived in simple, bare settlements and hunted for game with carved stone spears. The Yang-shao settled near the Huang He River around 10,000 BCE, over 12,000 years ago. Archaeologists have uncovered many Yang-shao villages in northern China. In one village, they found the remains of farmhouses built partly underground, with plaster floors, and roofs held up with wooden posts. By around 6,000 BCE, the ancient Chinese mined and worked jade, a semi-precious stone, to create utilitarian and ceremonial objects, ranging from indoor decorative items to jade burial suits. Around 3,000 BCE, another more advanced farming group appeared, the Lungshan people. The Lungshan were very advanced for their time. They harvested silk, and used it to weave fine fabrics. They used a potter’s wheel to make beautiful pottery. They baked strong bricks in ovens, and used them to build their homes. They worked together on flood control and irrigation projects. They had great engineering skills. And, they identified the social status of their deceased by the type and number of precious jade objects and ceramics in their burial mounds. Above are examples of Yang-shao and Lungshan pottery. Note how detailed, refined and, yes, fun these pieces are. By 2,000 BCE, farming settlements on the North China plain near the Huang He began to grow into cities. An early civilization began there, and Chinese culture today evolved from that ancient beginning. Because modern Chinese culture continues many of their ancient practices, some historians refer to China as the oldest continuous civilization in the world. Legend says that it was around this time that their "Great Engineer," Yu, founded the Xia (she-ah) Dynasty. What is a dynasty? A dynasty is a line of rulers who belong to the same family and pass control from one generation to the next. The Xia Dynasty lasted for over 500 years. There are no written records from this time period, however. Our knowledge of the life of the ancient Chinese during this time period comes from ruins of their town, ancient stories, and legends. 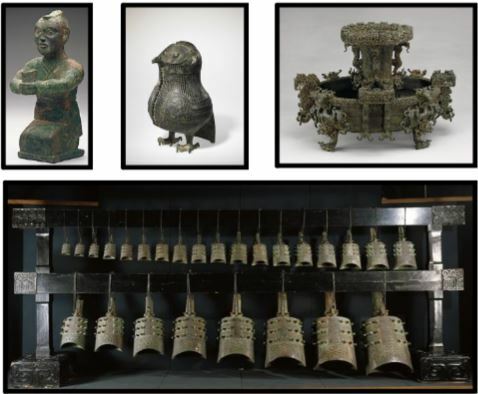 Shang and Zhou craftspeople were especially skilled working with bronze. 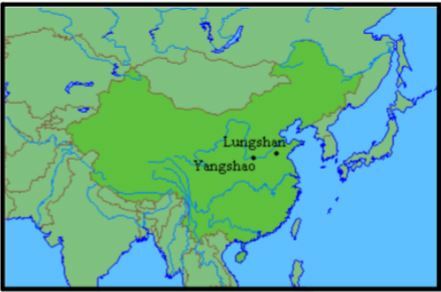 Shang & Zhou Dynasties: Because there are no written records from the Xia period, some historians still refer to the Xia Dynasty as "mythic" or "legendary." The historical record, however, becomes more indisputable in the mid 18th century BCE with the rise of the Shang Dynasty. For thousands of years, China was mostly a rural, agricultural society controlled by a series of powerful warrior-kings. In the beginning, rulers were not called emperors. They were called kings. The kings were responsible for religious activities and claimed to be related to the gods. In the mid-16th century BCE, Shang family kings began to unite the early agricultural communities and control some cities. The Shangs were the ruling family in China for nearly 700 years. After the Shang, the Zhou (pronounced “joe”) family took over. They ruled for about the same amount of time. Basically, for about 1500 years, two families ruled China. CLICK above to discover more about Chinese ancestor worship. 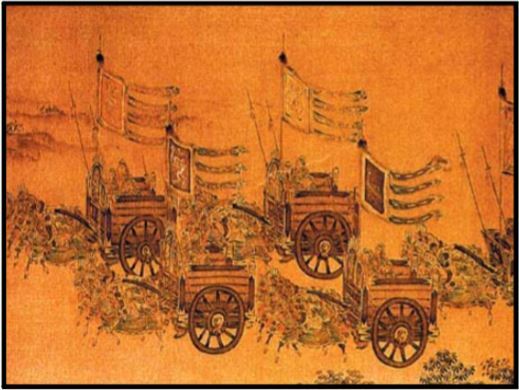 Daily Life During Shang & Zhou Times: Shang and Zhou times are known for their use of jade and bronze, as well as for their horse-drawn chariots, ancestor worship, highly organized armies, and human sacrifice. Protective walls surrounded cities. One Shang capital city, near present day Zhengzhou, was surrounded by a wall 30 feet high, 65 feet thick, and 4 1/2 miles long! Inside these walled cities lived the rulers, priests, and warriors. Merchants and craftsmen lived in mud houses built up against the outside walls of the cities. Farmers lived in nearby villages. During this time, Chopsticks were invented, which changed the way people ate their food. Why was ancestor worship important to the Chinese? Family: For both the rich and the poor, the family was all-important. The oldest male was the head of the family. If one member of a family did something wrong, the entire family was disgraced. Among the nobles, marriages were arranged to create a union between two clans or families, or to strengthen an already existing union. The young obeyed their parents without a fuss. This was an important part of ancestor worship. Even a wealthy noble with many servants might patch his father's robe with his own hands. Children looked forward to the day when they would be parents, and their children would honor them. The role of the woman was to be gentle, calm, respectful, and to obey her husband. In ancient China, home and family were so important that they were nearly sacred. Ancestor Worship: Ancestor worship was very important to the early Shang kings and nobles. It was a way of life. When a man died, the ancient Chinese believed his spirit lived on in the afterworld. They believed their ancestors had magical powers that could punish them or could help them make wise decisions. To keep their ancestors happy, they brought gifts of food and wine to special places or temples. They held many celebrations to honor their ancestors. CLICK above, then click on the oracle bone at the link to find out how the ancient Chinese used these bones to predict the future. Why did Shang kings use Oracle Bones? Oracle Bones: To communicate with the gods, the Shang kings used oracle bones, sometimes called dragon bones. Here's how it worked: The king or emperor would ask a question. For example, "Will it rain tomorrow?" The priest would carve the king's questions on an oracle bone, which was just an animal bone or turtle shell. Then, the priest would heat a bronze pin and hold the hot pin to the bone. This created a pattern of cracks over the bone. The priest, who was usually a woman, would study the cracks to find the answer to the question. Archaeologists now recognize oracle bones as the earliest form of Chinese writing, and they have found over 100,000 examples to study. Since many questions were asked about daily life, we know something about this civilization. The thing is, they didn't exactly ask, "Will it rain tomorrow?" Oracle bones say things like: "If we sacrifice ten men or five oxen, will it rain tomorrow?" The Shang kings sacrificed a great number of people to talk to their ancestors. Some of those sacrificed were enemies, captured in war. Some were slaves or people who were sick or deformed. Some were merchants, craftsmen, or farmers who had upset the nobles. Some were nobles who had upset the king. Shang & Zhou Kings and Nobles: The rich lived in large homes and palaces made of mud and wood. They had tall bronze candlesticks. They used bronze drinking cups. They loved to hunt. Their bronze weapons were decorated with elaborate designs. Horseback riding was very popular, both as a sport and, in late Zhou times, as a method of war. The nobles wore elaborate gowns of silk and lived in large, brick homes with tiled roofs. They were lavishly decorated and furnished. Jugs of wine lined the walkways. The air was scented with flowers in the gardens and spices from pots of food steaming on stoves. They were buried in lavish tombs. Unlike the ancient Egyptians, the Shang and Zhou were buried with living people. In their tombs, archaeologists have found entire chariots, objects of art, and the remains of guards and dogs who accompanied kings to their graves. This ancient print shows Zhou warriors charging into battle. What social group made up the majority of the ancient Chinese population? Warriors: The leaders of different clans were continually waging war with each other. Warriors were knights in bronze armor who went to battle in horse-drawn chariots made of wood and bronze. They wore bronze helmets, and carried daggers, spears, and axes. Each chariot had a driver, a spearman, and an archer. Behind them, came the foot soldiers, who were usually peasants, forced to leave their fields. Foot soldiers wore tunics and trousers. Farmers: Most people were peasant farmers. Their life was very hard. Farmers lived in villages near the cities. Their homes were very simple. In the summer, peasants lived on the land near their fields. Summer homes were made of bamboo branches. In the winter, they moved to their permanent homes in the villages. Winter homes were drafty. They were one room houses with thatched or tile roofs, dirt floors, and no furniture. The walls were made of mud. Doors faced south. Each peasant family had their own winter home. They farmed small plots of land with primitive stone and wood tools. They did not own the land. Theyworked the land assigned to them by the royals and the nobles. They had to give the nobleman part of the food they grew. They were also expected to give gifts of wine or silk to the noble. They worked without pay on the noble's house, roads, and bridges. They pretty much worked all the time. Merchants and Craftsmen: Since this group did not produce food and were not part of the nobility, they were outside the class structure. Like slaves, they were hardly considered men. In times of war, when the city was attacked, they were not taken inside the protective walls, but were left to fend for themselves as best they could. Religion: Their gods were the gods of nature, including the river god, the rain god, the earth god. They believed in many gods, but the most powerful was the sky god, the king of gods. If you asked someone in ancient China what gods they believed in, they would probably say the proper and seasonable worship of the gods of the rivers and mountains, and wind and moon, and of our noble ancestors. Many of the celebrations and festivals that honor these ancient gods are still celebrated by the Chinese today. Honoring gods and ancestors was very much a part of ancient Chinese daily life. How did Chinese rulers use the Mandate of Heaven? Mandate of Heaven: When the Zhou overthrew the last Shang king, they had to convince the people, especially the nobles, that they had the right to rule. To do so, the Zhou invented the Mandate of Heaven. The Mandate of Heaven is the belief that heaven gives someone the right to rule. When the Zhou took over, they told people that Heaven (T’ien) had decided to appoint them rulers and that it was the wish of the gods for the Zhou to lead the people. The Mandate of Heaven, however, was not a free pass for the new rulers. Instead, it functioned like a kind of contract. Under the Mandate of Heaven, rulers promised to be moral, ethical and good. In exchange, the people promised to be loyal and obedient. Bad leadership gave the people the right to rebel. When ruling with the Mandate, there were four ways that a dynasty could lose power. The first way to lose power was by becoming corrupt. The second way was through the occurrence of natural disasters such as floods, droughts leading to famine, or earthquakes. All of those events were seen as signs that the heavens no longer favored the rulers. The third way to lose power was to mistreat the people. When Zhou rulers took power from the Shang dynasty, they told the people that if the Zhou became selfish or unkind rulers, Heaven would withdraw support and the Zhou dynasty would end forever. If that were to happen, they assured the people, Heaven would appoint a new leader. The fourth way to lose the power of the Mandate was to be defeated in war. When any of those four things happened, a new dynasty would take power and the dynastic cycle of the Mandate of Heaven would begin anew. Here is a quick peek at who was who and what was what in ancient China.